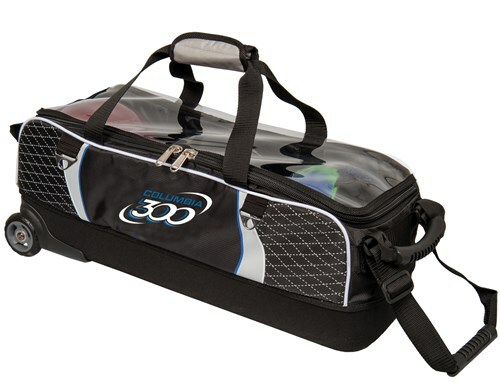 Join Team Columbia and get one of their slim triple tote/roller bowling bags! The Team Columbia Slim Triple Tote/Roller bowling bag is packed with lots of high performance features that will solve all of your bowling tournament travel bag needs. This tough and durable bag is made of a 840D/1680D material, has premium YKK luggage zippers, and 3 inch in-line skate wheels. End pick-up handles on both ends make this bag easy to get in and out of your car or from the baggage claim while the adjustable tow strap makes the bag easy to pull. 11/24/2017 - By John M.
Due to the time it takes to produce the Columbia Team C300 Slim Triple Tote/Roller ball it will ship in immediately. We cannot ship this ball outside the United States.